The Mayor's 'smoothing traffic flow' policy means not taking any road space from traffic at all, even when there is huge demand from pedestrians". If you have a system where the next Elephant & Castle is like the old one – built so that people can belt through in their cars – it's a community that will never really come to life. What you want is a scheme where people can cross the road and cyclists can go round, so it's not somewhere people pass through and the shopping precinct is just for the poorest people who can't afford to go somewhere better. You actually want a genuine community, and no-one ever built a community around a miniature Formula 1 track. Livingstone, in his first term as Mayor, introduced the Congestion Charge, which kick-started the modern expansion of cycling in London. 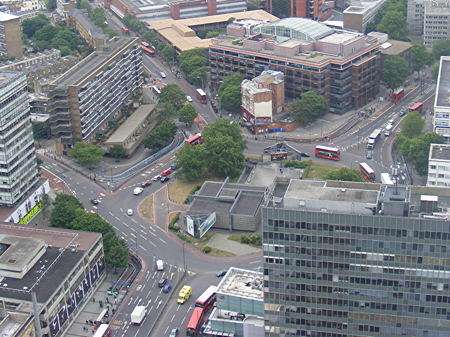 Johnson rolled the Congestion Charge back, abolishing the Western Extension. During Livingstone's first period in office, 2000–2004, the cycling casualty rate on TfL roads fell substantially. The most likely reason for this is the expansion of the bus lanes on TfL roads at this time. Since then, there have been no further improvements. Johnson, with conservative councils such as Barnet and Westminster, has been cutting the bus lanes back, and, where they remain, allowing motor cycles into them. Livingstone proposed linking Camden Town and Brixton with the Cross River Tram, which would have brought this most progressive and intelligent form of mass surface transport back to London for the first time in over 50 years. One of Johnson's first acts as Mayor was to cancel the tram, wasting the millions of pounds that had already gone into its planning. Livingstone has committed to re-instating the tram project. The question now is not how to demolish that policy, but how to develop and improve it. I remember that Oliver Schick, of LCC and Hackney Cyclists, commented at the time that this was a bizairre choice of phrasing. For, asked Schick, why would he put it like that, if "demolishing that policy" not exactly what Johnson was thinking of doing? This was a perspicacious observation. For "demolishing that policy" is precisely what Johnson has done. He has replaced it with the car-centric policy of "smoothing the flow" and the equally car-centric TfL Network Operating Strategy that is currently up for consultation. Johnson's only cycling achievement has been the launching of the Barclays Hire Bikes, which was supposed to generate 60,000 trips per day, but has only generated 25,000 in reality, and was, in any case, a project that was started by Livingstone. I do not count the dismally failed Cycle Superhighways a cycling "achievement". I love my bike, and in the moments when it is not raining in London – 94 per cent of the time – I simply can't understand why people would want to use any other method of transport. If he is the type of cyclist who "simply can't understand why people would want to use any other method of transport" – and there are a few more of those who responded to my post Cycling is dangerous – then he is the type who can't understand why most other people would need a revolution in conditions on the roads in order to persuade them to cycle. Livingstone is not a cyclist, he is a public transport fan. Nevertheless he does seem to have some grasp of what the problems are with cycling on London's roads at the moment, that prevent 98.5% of the population from doing it. You could respond to TfL's consultation on its Network Operating Strategy. The deadline is tomorrow, Friday, and the Cycle of Futility blog has an excellent "crib sheet" on what is wrong with the strategy (short answer: everything) and suggestions on how to respond. I can't help thinking, though that such consultations are pretty much bureaucratic paper exercises, done because the law says they must be done, which don't much affect what happens. For what happens on the streets of London in the future will be politically directed, by the Mayor, whoever he is, and it is the views and policies of the mayor, not the bureaucrats' Operating Strategy, that will determine whether we get a filthy, noisy and dangerous city designed primarily for motorists, or a safer, cleaner, more pleasant one one that balances up the needs of all citizens more fairly. I can't help thinking, therefore, that those who care about these issues might better spend their time, rather than responding to probably irrelevant consultations, in starting to work to ensure that someone other than the present incumbent is returned at the mayoral election in May 2012. "starting to work to ensure that someone other than the present incumbent is returned at the mayoral election in May 2012. " It's a shame, but this is a party political issue. Our only chance is to dump the tories. Great post, I agree with all your points. Its good to see some straight talking about the damage this increasingly car-focussed approach is doing to our capital, as well as low probability of consultation responses having any discernable impact.